Alternative energy is a term used for any energy source that is an alternative to using fossil fuels. Alternative names include Renewable Energy, Green Energy and Clean Energy. The primary source of alternative energy is the sun. Interseasonal Heat Transfer is a new form of on site renewable energy that combines the merits of solar thermal collection in summer with heat storage in ThermalBanks to double the efficiency and Coefficient of Performance of ground source heat pumps in winter. Interseasonal Heat Transfer also captures cold on winter nights, stores this in ThermalBanks™ in the ground and releases it to cool buildings in summer. An IHT system includes an Asphalt Solar Collector, a ThermalBank to store heat energy, a heat pump and a smart control system. Intrabuilding Heat Transfer is the transfer of excess heat from hot rooms within a building to cold rooms needing space heating. ICAX is able to extract heat from IT fileserver rooms and transfer it to cold rooms by using the heat transfer mechanism in the ICAX Skid in conjunction with WR2 technology from Mitsubishi Electric. Intrabuilding Heat Transfer saves energy by balancing the heating loads and cooling loads within a building. Where a building suffers an overall cooling need in summer, ICAX uses Interseasonal Heat Transfer to transfer the excess heat to a ThermalBank in the ground. Where an overall heating need exists in winter ICAX recovers the stored heat from the ThermalBank to heat the building in winter using the ICAX Skid which incorporates heat pumps. Intrabuilding Heat Transfer is a major step towards balancing the heating loads within a building and achieving Zero Carbon Buildings. A Thermal Bank is a bank of earth used to store heat between seasons. Alternative descriptions include: Heat Bank, Heat Battery, Heat Store, Heat Vault, Underground Energy Storage, Seasonal Heat Store, Interseasonal Heat Store, Seasonal Thermal Store, Interseasonal Thermal store, Underground Thermal Energy Storage ("UTES"), Rechargeable Heat Battery. A Solar Road System is a road which captures solar heat in summer, stores the heat in a ThermalBank until it is needed to prevent the road freezing in winter. A Solar Road System can save lives. It also cuts out the need for salting of roads and prolongs the life of the road by reducing extremes of temperature in summer and in winter. Also known as Under Road Heating. A Solar Collector collects heat from the sun. Flat plate or evacuated tube solar thermal panels are generally roof mounted and can be an efficient means of providing domestic hot water (DHW). However, these solar panels are expensive and without significant heat storage capacity the heat collected may not be fully used. An Asphalt Solar Collector collects solar heat energy from the surface of black roads for storage in thermal banks and use for space heating in winter. This solar recharge can be used to increase the coefficient of performance of ground source heat pumps. Alternative names for an Asphalt Solar Collector include: Playground Collector, Thermal Road Collector, Blacktop Solar Collector, Hot Roads, Solar Roads. An Asphalt Heat Rejector can be used to reject heat energy from the surface of roads as a means of natural cooling to release heat from buildings that need cooling. They can also be used to reject heat from ThermalBanks to create a cold store in winter for use in cooling buildings in summer. An Watertight Solar Collector collects solar heat energy from the surface of flat roofs for storage in thermal banks and use for space heating in winter. A Watertight Solar Collector provides the dual functions of providing complete waterproofing for flat roofs and solar thermal collection. Alternative names include: Solar Roofs, Solardec, Solar Thermal Roofs, Flat Roof Solar Collectors. An Underfloor Heat Collector collects heat energy from underfloor heating pipes for storage in thermal banks and use for space heating in winter. A side effect of heat collection from within buildings is that natural cooling is provided at very low cost. A Heat Pump is a machine working on the Carnot cycle which transfers heat from a heat source to a heat sink. A refrigerator uses a heat pump to move heat out of a fridge. An industrial heat pump can be used to move heat from an external source into a building. See also: Glossary on Heat Pump terms. A Ground Source Heat Pump ("GSHP") extracts heat from the ground and transfers it into a building to provide space heating. Alternative names include: Ground Coupled Heat Pumps, Earth Energy Systems, Geoexchange Heat Pumps, Ground collector heat pumps, Geothermal heat pumps. GSHPs are now established technology with over a million installations (largely in North America, Sweden, Switzerland and Germany). GSHPs are emission free at the point of use and need no flue or chimney. A Ground Source Heat Pump can achieve a coefficient of performance of 4 if used in conjunction with a low temperature delivery system like underfloor heating. An ordinary unassisted GSHP can compete economically with conventional oil fired heating or electric storage heating. Gas fired heating may be cheaper than an ordinary GSHP installation, although a GSHP will have lower CO2 emissions. It is possible to double the CoP of a GSHP if used with an ICAX ThermalBank. A full Interseasonal Heat Transfer System (incorporating an asphalt solar collector, ThermalBank and GSHP) can show a lower annual heating cost than a gas fired boiler and can save over 50% of carbon emissions compared to a gas fired boiler. Using IHT is the key to energy savings in buildings. In addition, IHT can provide "Free Cooling" to extract some heat from buildings a very little cost using asphalt heat rejectors, or active cooling using the principles of IHT in reverse. 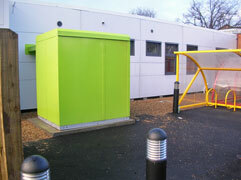 An Air Source Heat Pump ("ASHP") extracts heat from the air and transfers it into a building to provide space heating. As no ground works are involved, an ASHP installation will generally have a lower capital cost than a GSHP, but a higher running cost for winter heating. A Ground Water Source Heat Pump ("GWSHP") extracts heat from ground water and transfers it into a building to provide space heating. Underfloor heating ("UFH") is an efficient method of distributing heat into a building to provide comfortable space heating. Lower temperatures (around 40°C) can be distributed over a larger area than the higher temperatures (around 70°C) needed for wall mounted radiators. Underfloor heating is invisible and clutter-free and radiates heat gently from ground level to avoid the convection and heat losses generated by wall mounted radiators. Underfloor heating makes a good match for distributing heat from a ground source heat pump - because a GSHP will deliver a higher coefficient of performance if a lower delivery temperature can be used. The underfloor piping can also be used to extract heat from the building in summer by circulating cold water to provide "critical period cooling". The coefficient of performance ("CoP") is a measure of the efficiency of a given heat pump under standard conditions: the change in heat delivered over the electricity consumed. However, the CoP will vary greatly under different conditions: a modern heat pump should achieve a CoP of 4 if starting from a temp of 10°C from the ground and delivering 40°C to underfloor heating. If the same pump starts from a temperature of 25°C from a ThermalBank it will have half as much work to do to achieve a 40°C output temperature, and this will double the CoP achieved. In practice the CoP of a standard heat pump across the winter season can fall from 4 at the start of the heating season to below 3 as the ground gets colder as heat is extracted. Similarly, the seasonal CoP of an ICAX system will fall from the autumn level of 8 to 5.5 as heat is extracted from the ThermalBank. The Seasonal Performance Factor ("SPF") is a measure of the heat energy extracted from the ground over the heating season divided by the amount of electricity used to do so. It is a measure of the efficiency of a ground source heat pump installation at a particular site and will depend on the ground conditions and the design of the ground loop and the heat delivery system used in the building as much as the efficiency of the heat pump itself. The SPF will improve if the ground it charged with heat in summer in order to reduce the amount of work needed by the heat pump in winter. The Energy Efficiency Ratio ("EER") is another term used for the CoP (above). The term "EER" is often used in place of "CoP" when cooling is being discussed instead of heating. The Seasonal Energy Efficiency Ratio ("SEER") is another term used for the SPF (above). Seasonal Energy Storage ("SES") is the storage of heat energy from the time it is available in summer until the time it is needed in winter. Heat can be stored on a large scale in ThermalBanks™the ground. Alternative names for Thermal Energy Store are heat store and heat battery. Thermal Energy Storage ("TES") is the storage of heat energy from the time it is available until the time it is needed. Heat can be stored on a small scale in water tanks or in phase change materials over a number of days or solar recharge can be used on a large scale to store heat in the ground from one season to another using ThermalBanks. Alternative names for Thermal Energy Store are heat store and heat battery. Seasonal Thermal Energy Storage ("STES") is the storage of naturally occurring heat energy from the time it is available in summer until the time it is needed in winter. 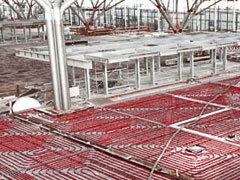 Heat can be stored on a large scale in ThermalBanks™in the ground. Alternative names for Thermal Energy Store are heat store and heat battery. Other terms like "GeoSolar" have also been used. Whatever the term used, you can be sure that ICAX will not "charge you the earth for charging the earth". Solar Thermal Energy Storage ("STES") is the storage of naturally occurring heat energy from the time it is available in summer until the time it is needed in winter. 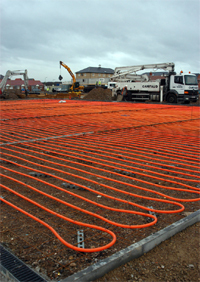 Heat can be stored on a large scale in ThermalBanks™ in the ground. Aquifer Thermal Energy Storage ("ATES") is used to store energy in open loops in aquifers and balance the heat demand of buildings on a large scale over the seasons. This technique has been used successfully in Holland. If there is movement in the aquifer any stored heat may have moved on before the time for retrieval. See Aquifer Thermal Energy Storage. Borehole Thermal Energy Storage ("BTES") is used to store energy in the ground using closed loops boreholes to balance the heat demand of buildings on a large scale over the seasons. See Borehole Thermal Energy Storage. 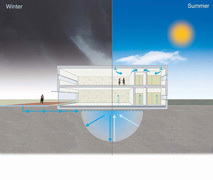 Underground Thermal Energy Storage ("UTES") is used to store a large amount of heat energy in the ground to balance the heat demand of buildings on a large scale over the seasons. The term "underground heat storage" is also used. See ThermalBanks. An Open Loop Heat Pump system forfeits the benefits of Thermal Storage and focusses, instead, on Heat Exchange. The logic for an open loop system is that it can avoid the problems encountered by a closed loop system that is connected to a ground loop which is too small: as heat is extracted from a small volume of ground the temperature of the ground will fall and the heat pump has to work harder to extract heat out of colder ground. If heat is exchanged in an open loop with water from a flowing river (or a large body of open water) then the temperature of the heat source will be constant. This approach can be employed on a large scale, but attention needs to be given to filtering the water used to ensure that the system remains "open". An Open Loop Heat Pump may be referred to as a Water Source Heat Pump, or a Marine Source Heat Pump if the heat exchange is with the sea. A Thermal Response Test ("TRT") measures the heat capacity and heat conductivity (λ) of soils and rock around a closed loop borehole to asses its suitability to extract heat for use with a ground source heat pump installation. Although a TRT may cost £20,000 it is highly recommended to gauge the properties of a test borehole heat exchanger before the design of a borehole field is finalised, because an inadequate capacity may lead to an ineffective ground energy installation and over capacity will incur unnecessary cost. If the borehole field is to be used as a ThermalBank to store heat in an Interseasonal Heat Transfer installation it is critical that the soil properties are measured in order to achieve a well balanced system. This term has also been used to describe Interseasonal Heat Transfer. Free Cooling is used to mean "heat dumping" from a building "source" to an external "sink" purely by means of circulating water to transport heat out of the building. This can also be called direct coupled cooling. "Critical period cooling" is the use of free cooling to cover brief times of high need for cooling – at a much cheaper price than full air conditioning. Free Heating is used to mean heating a part of a building using "waste heat" recovered from chillers or industrial processes without cost. Solar thermal energy is heat derived from the sun's radiation captured by solar collectors to heat water or provide space heating. See Solar Thermal Energy. Solar thermal storage is the storage of heat captured from the sun at a time of low demand until needed at another time, or another season, for space heating. See Solar thermal storage. TermoDeck’s system of hollowcore concrete slabs, first used in the UK in the Elizabeth Fry Building at the University of East Anglia, allows ventilation to pass through the supporting structure of a building. This, in conjunction with a high standard of insulation, exploits the thermal mass of the structure to absorb heat and retain heat in winter. In summer the ceiling units can be cooled overnight by circulating air through them. This eliminates the need for mechanical cooling systems during the day. 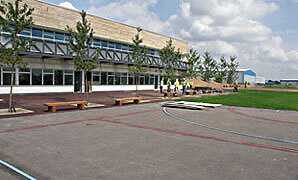 Hollowcore concrete construction works well with Interseasonal Heat Transfer, as demonstrated at Howe Dell School, Hatfield. Earth Tubes are a means of stabalizing the temperature of ventilation air drawn into a building through tubes in the ground to cool incoming air in summer and heat incoming air in winter. A Ground Air Heat Exchanger ("GAHE") can provide controlled ventilation and improve the air quality in buildings by exploiting the energy stored in the ground. At a depth of 2 metres the ground is a constant 8-12°C. By drawing air through an underground network of pipes, a GAHE can help to heat in coming air in winter and cool in coming air in summer. Thermal mass is the capacity of a material to store heat. In building terms, a structure with a high thermal mass, like a medieval cathedral, will be slow to heat up by day and slow to cool down by night because of the thermal inertia of the stone it is built with. Modern buildings can benefit from lower heating needs, and lower cooling loads, if they incorporate large amounts of concrete or other materials with a high thermal mass. Thermogeology is the study of the movement of heat through the ground. An understanding of thermogeology is critical for those who design ground source energy systems and ground sink energy systems using heat pumps. The aim of a designer seeking a sustainable heating and cooling system over the long term must be to balance the heat extracted from the ground with the amount of heat deposited in the ground over the seasons. Genuine Geothermal Energy is derived from heat within the earth. In Iceland and some other parts of the world where high temperatures reach close to the earth's surface it is possible to capture and use this heat. However, this term, or Shallow Geothermal Energy, is sometimes also used to refer to ground source energy from shallow depth, although the heat originates from the sun. A Geothermal Aquifer is a source of heat from a hot spring near the surface, as found in the city of Bath. Hot Rocks is a form of Geothermal Energy where very high temperatures can be reached by drilling down to depths of a few kilometres (at large expense and high risk). There are ambitious plans to commercialise this form of energy in Australia to generate electricity. There are similar dry rock plans to construct a £30 million power station of 5MW in Germany based on drilling down four kilometres to access ground water with a temperature of 130°C. 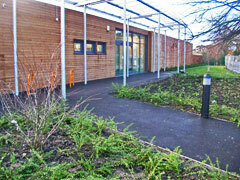 This might also allow the residual heat to be used for a community heating scheme. Geothermal Engineering Ltd aim to install the first Engineered Geothermal System (EGS) in the UK. The power output of the first plant near Redruth in Cornwall will be approximately 10MW electric and 35MW of renewable heat for local use (enough heat for 15,000 homes). The planned start date for drilling 4 kilometre boreholes to access hot dry rocks at 150°C is 2010, subject to planning approval, with the plant operational by 2013. Renewable Heat is a form of Renewable Energy for buildings involving the re-cycling of heat from natural resources. Alternative names used for Renewable Energy include: Green Energy, Clean Energy, cleantech and Alternative Energy. An alternative names for Renewable Heat are Green Heat and Clean Heat. Renewable Cooling is the provision of cooling to buildings by using re-cycled natural, renewable resources, instead of consuming fossil fuels. The standard solution for providing cooling to buildings is to use chillers and air conditioning which uses a very large amount of electricity: this is expensive and (if the electricity comes from a power station which is powered by gas, oil or coal) will cause the release of large quantities of CO2 into the atmosphere. There is a better way to achieve cooling in buildings. This is an exciting by-product of Interseasonal Heat Transfer™. Having installed IHT™ in a new building to provide Renewable Heat in winter all the mechanism is in place for the IHT system to work in reverse and provide Renewable Cooling in summer, at a fraction of the cost of using air conditioning and chillers to provide cooling. An alternative name for Renewable Cooling is Green Cooling or Natural Cooling. Energy Recycling can be a very effective form of saving money and saving carbon emissions. Interseasonal Heat Transfer performs Energy Recycling by collecting surplus heat in summer, storing it in ThermalBanks over the autumn and recycling it through ground source heat pumps back to the building in winter. You don't have to pay twice for the same thing: IHT saves heat energy when you have more than you need, and returns it to you when you have less than you need. District heating is a system for generating heat at a central location and distributing heat for space heating and hot water to residential and commercial properties. District heating plants can provide higher efficiencies and lower carbon emissions than local boilers, especially if based on Interseasonal Heat Transfer. The temperature set point for heating is the temperature at which heating systems are triggered to act to stop the temperature falling below the set level. In Britain the set points have often been as high as 21°C, but running costs increase for every degree that the temperature is lifted above the external temperature. The temperature set point for cooling is the temperature at which air conditioning or other cooling systems are triggered to act to stop the temperature exceeding the set level. In Japan the recommended internal office temperature in summer is set at 28°C. In Hong Kong and Australia the recommended internal office temperature is set at 24°C. In Britain the set points have often been as low as 22°C, but it is estimated that running costs increase by nearly 20% for every degree that the temperature is lowered. Intelligent buildings result from careful design which incorporates electronic controls to manage heating, cooling, ventilation, humidity, lighting and access to maximise the comfort, health and security of the internal environment and to minimise the energy consumed in the building. See also Building Physics. Global warming is being accelerated by the release of greenhouse gases from burning carbon fuels at a faster rate than they are being captured by nature. This may lead to unpredictable Climate Change, or Climate Chaos. The Merton Rule is named after Merton Council which adopted the first prescriptive planning policy that required new commercial buildings over 1,000 square metres to generate at least 10% of their energy using on site renewable energy. In 2008, the Government's Planning Policy Statement requires all UK local planning authorities to adopt a "Merton Rule" policy.